Backdropped by Earth's horizon and the blackness of space, space shuttle Discovery and its remote manipulator system/orbiter boom sensor system (RMS/OBSS) is featured in this image photographed by an STS-133 crew member while docked with the International Space Station on March 6, 2011 during the shuttle's last flight, STS-133. HOUSTON –NASA's final flight of the space shuttle Discovery is nearing its end, and the six astronauts riding on the orbiter will pack up their things today (March 8) and make sure the winged spaceship is ready for one last trip back down to Earth. The shuttle's 13-day mission, called STS-133, is the orbiter's last before being retired from service. The shuttle launched on its final flight on Feb. 24 to deliver supplies, a new storage module and a humanoid robot assistant to the space station. Inside the newly installed Permanent Multipurpose Module (PMM) on the International Space Station are the six crew members of the STS-133 crew. After a special wakeup call to the song "Blue Sky," performed by Big Head Todd and the Monsters live here at NASA's Johnson Space Center, the astronauts will begin tasks to ready the shuttle for its landing. Today's wakeup tune was selected by fans in a public contest held by NASA, and the band surprised the astronauts by performing the song live in Mission Control. Shortly after waking up, shuttle commander Steve Lindsey, pilot Eric Boe and mission specialist Nicole Stott will begin checking Discovery's flight control system. 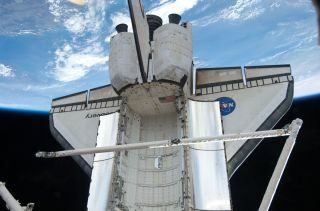 The astronauts will then begin packing and securing items in the shuttle's cabins. At 6:38 a.m. EST (1138 GMT), Lindsey, Boe and Stott will return to the shuttle's flight deck for what is known as the Reaction Control System (RCS) hot-fire test. This involves firing each reaction control jet to make sure they are in good working order. The jets are used during approach to help Discovery control its entry and landing. At 11:23 a.m. EST (1623 GMT), the six astronauts will participate in a live media interview with three news agencies to talk about the mission. The crewmembers will then hold a special tribute to the shuttle Discovery. The astronauts will send down a message that they put together to commemorate Discovery's final flight and the legacy of NASA's oldest and most-flown spacecraft. The crew's final task of the day will be to fold up the shuttle's communications antenna, used to provide high data rate transmissions. They are then scheduled to go to sleep at 7:23 p.m. EST (0023 GMT), in preparation for tomorrow morning's re-entry into Earth's atmosphere. NASA is bringing its 30-year space shuttle program to an end later this year, and following the STS-133 mission, Discovery will be grounded for good after 27 years of spaceflight. NASA has two final space shuttle missions planned – Endeavour's STS-134 flight in April, and the very last STS-135 flight of Atlantis in June.